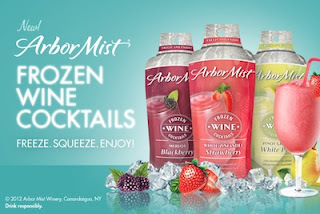 Arbor Mist Frozen Wine Cocktails | Moms Need Wine! I had the great pleasure of receiving a lovely assortment of the new Arbor Mist Frozen Wine Cocktails to try out. Of course I had to do my part and try all 3 varieties to be sure I gave an accurate review. It was a tough job but someone had to do it! I received the Blackberry Merlot, Strawberry White Zinfandel and White Pear Pinot Grigio flavors. I have never tried any of the frozen wine beverages before and honestly, I wasn't sure if it would be something I would like. In my mind I figured it would be too icy for me. I put the pouches in the freezer and left them in there for the recommended 5 hours. First up was the Blackberry Merlot. I tore the top off the pouch and squeezed it into my wine glass. It was not super icy like I thought it would be. It was very smooth which is more of my thing. I took my first sip out of my straw. I loved the flavor. It was so refreshing and everything I hoped it would be! I had my husband taste it because he is the picky one. Guess who had me open another pouch? Yep, he loved it too! Since he took a few sips from my glass, I felt like I did not have the full serving *ahem* so I opened up a pouch of the White Pear Pinot Grigio. I normally don't drink white wine so I had no idea what it would taste like. I LOVED this one even more! The texture was perfect and it is my new favorite. The next evening I tried the Strawberry White Zinfandel. It was good but I much prefer the first two. I really love having a frozen cocktail that doesn't require breaking out the blender and having multiple ingredients. You can beat the 'freeze, tear and squeeze' method! I can totally see having a cooler of these at a cookout or gathering and it would be awesome for a girl's night in! I will be purchasing these in the future and highly recommend them. If you have tried them, what do you think? If you plan to try them in the future, I would love to hear your thoughts! Check out Arbor Mist on the web, Facebook and Twitter. *You must be 21 or over. I received products samples for review from SheSpeaks. All thoughts/opinions are always my own. I liked them too. The Merlot was my favorite, as it was the least sweet. I think the servings should be bigger! We appreciate you and hubby "suffering" through these in order to write a complete and accurate review. =) Gotta try them. I've been wanting to try these out. 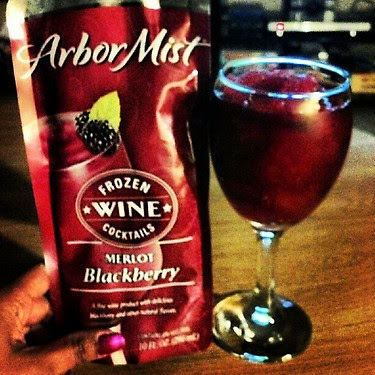 Not a big wine drinker but I do like the Arbor Mist brand. I will really try that cocktail. I want to know what is the difference of the taste when you talk about the taste of a frozen cocktail and a normal cocktail.